April is going to be an important time of the year for i95Dev with us attending two major events Magento Imagine 16 and Microsoft Envision 16 (Microsoft Convergence earlier). Microsoft Envision 2016 (previously known as Microsoft Convergence) is one of the major events in Microsoft Portfolio of Events. Envision 2016 has been meticulously structured to help business leaders discover breakthrough insights into technology and solutions, that can help them and their business achieve more in a mobile first, cloud first world. 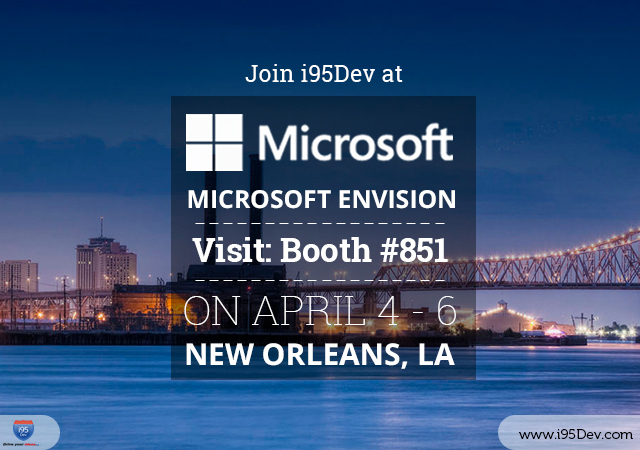 This April, Envision 16 @ New Orleans, Los Angeles will host eminent speakers like Satya Nadella (CEO, Microsoft) and Dan Schulman (President and CEO, Paypal) and we are excited to be attending the event (booth #851). With over 200 sessions and nearly 300 brands, Envision 16 promises amazing learning opportunities. Microsoft Convergence was undeniably one of our favorite times of the year and we are positive Envision 16 is going to be an even more incredible event for businesses and their leaders alike. i95Dev’s team will be available at booth 851 to answer any queries that you might have related to eCommerce, omni-channel commerce, integration and more. Ecommerce Growth Engine (EGE) – a feature rich, multi-channel, integrated eCommerce platform for Microsoft Dynamics ERP suite (GP, AX and NAV). i95Dev Mobile POS – the amazing Mobile POS seamlessly integrates with your eCommerce and ERP system enabling your sales representatives to close deals on the move. Our brand new integrated eCommerce solution that will enable business leaders to go Omni-channel, with just click of a button, without having to worry about back office ERP integration! Also, ERP Partners too can leverage this solution to demonstrate the power & ROI of an integrated eCommerce system easily to their customers. Click here if you would like to schedule a meeting with one of the i95Dev experts.